Tuna, Ham, Chicken… all salads. -Ish. The font and speech bubble fluctuations continue apace. They grow more unstable with each passing minute. There are no other survivors, and the last of my firewood burns to embers before me. Never before have I feared the stars, yet now I see them not as divine protectors watching from the firmament, but as looming predators waiting for the right opportunity to present itself. Interesting how she goes from “Oh I’m soooooo drunk” to “I don’t trust you” in a split second. The facial expression is great. By the by – since me and thee are both in Central time zone, howcome this comic is listing times in Eastern? It being 12:45 currently. I’m on Eastern and the comic wasn’t up before 1:00 my time. It never is. I’m showing 1:50 currently, and your post being made at 1:46 if that helps? Apparently I had the time settings at UTC-5 instead of UTC-6. Woops. XD Thanks for catching that. “Pukey bean juice?” Where did Todd take them? And where’s Andi? And I think that’s Andi standing behind Amanda on our left, giving Amanda the water in panel one; the adult in panel two that is obscured by the corner of panel one. 8 pages ago (not counting a far-distant image the size of my fingernail) and looks kind of like a sweater or turtleneck. You have a point about the colour not being much of a clue. Still, only Andi calls Amanda ‘kiddo’. That’s why I wasn’t left wondering. It is by caffeine alone I set my mind in motion. It is by the beans of Java that thoughts acquire speed, the hands acquire shakes, the shakes become a warning. It is by caffeine alone I set my mind in motion.” – The Programmer’s Mantra (parodied from the Mentat Mantra in David Lynch’s Dune (film)). If you love coffee and hate philosophy; there are excellent coffee quotes on Wikiquote. If you love philosophy and hate coffee, there are also excellent coffee quotes on Wikiquote. That reminded me of this, Meat Lover’s Salad. 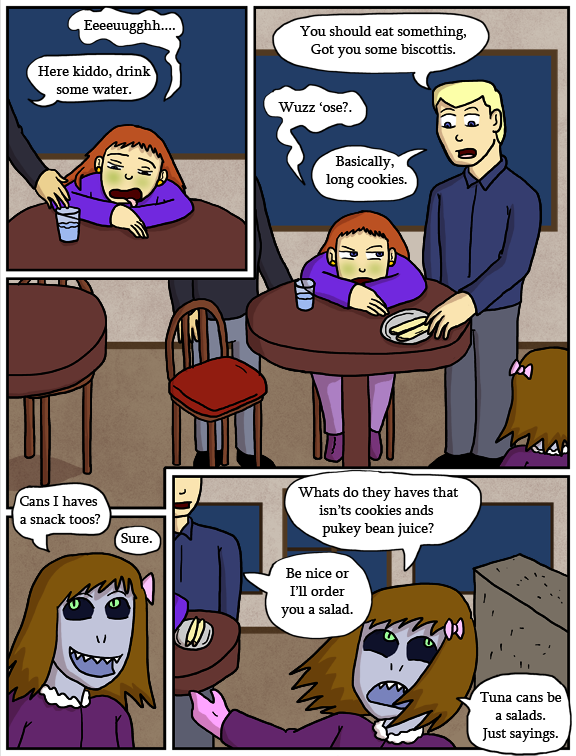 Don’t forget to look for the invisible bread to see the secret comic on the bottom right of the strip. I’ve completely lost track of the events in the classroom… what was the big row between the girls about, with the party, and the fight in the bathroom? can anyone give me a run down of the events and who punched whom and why? Amanda found out that Heather had told Selkie her secret about being dumped off at the orphanage, and was pissed. i don’t remember exactly what the argument about the party was about, but it was involved in setting off Amanda’s temper flareup, that ended in the punch. And here we see the results, or at least *a* result, of the font thread. I’m liking it. Here’s a salad Selkie would love. You could always go the “Different font per character” route that some do, if you want. True! I eat tuna salad with just tuna and mayo and chopped egg. Selkie could totally have that. It’s just some people add pickles. “mayo” is egg and VEGETABLE OIL, along with a few spices. Probably not a good plan for her. That “meat salad” that was linked? With “beer-fried bacon” and “beer dressing”. Since beer is grain and hops (both vegetables) and water – again, probably not a good idea for her. I vaguely remember Dave saying that Selkie could handle some vegetable products in small amounts, and the beer in the salad has fairly little vegetable matter. In any case, the beer could certainly be replaced with chicken stock. Also, I’m pretty sure vegetable oil isn’t particularly bad. Cats, for instance, can eat vegetable oil. Granted, it has laxative effects, but in a much larger quantity (relative to body mass) than a typical tuna salad. I imagine she can eat eggs, it’s just another protein. But can she have mayo? I don’t know if the lemon juice and vinegar in that recipe are structurally required for the mayo to work, or a concession to human taste buds. I’m not sure if Selkie likes acid tastes; we like a touch of sourness in some foods to counteract fats or balance sweetmess, probably because fruits can be tart. Even if she could tolerate the small quantity used in the brown butter mayo, she might think it tasted yucky. Probably her idea of a good tuna salad is a bowl of chopped-up canned tuna. I made a meat salad once. It has to be cooked however and requires no less then four different kinds of oil for maximum flavors. Could you post a specific recipe? English has walked up behind the word’s original language, hit it on the back of the head with something heavy, and stolen it. It will now be pluralized with an S erratically, like ninja/ninjas. Or elses he’s picking ups randoms S-habits froms Selkie. I love the way Kingdom of Loathing has fun with weird plurals (box / boxen). I’ve started using “octopodes” myself, and occasionally throw in another couple weird ones I can’t think of offhand. Why did I not notice until just now (just minutes away from the next update) that Amanda has a green tint?